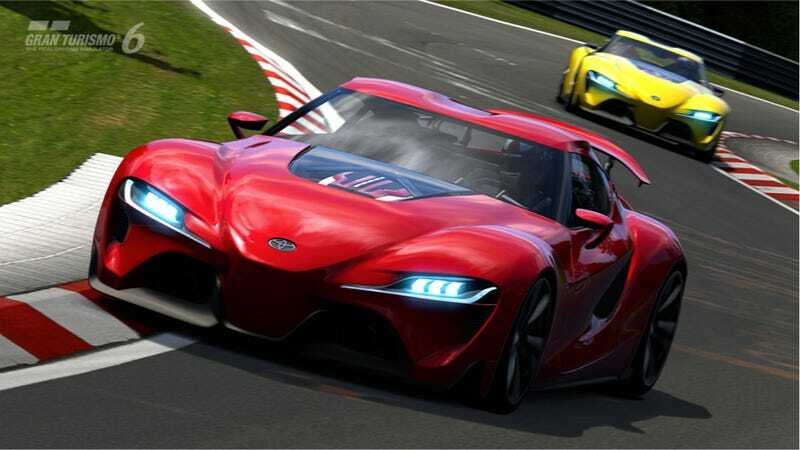 Well, you can drive the Toyota FT-1 if you've got a Playstation and a copy of Gran Turismo 6 spinning around inside of it. Gran Turismo has again teamed up with an automaker — this time Toyota — to bring fanciful products to life. An update to the game went live yesterday and included a free copy of the FT-1 for anyone who followed along with our Detroit Auto Show coverage and immediately thought "Oh yeah, I gotta hit that." While the FT-1 is still just a far-out concept at this point, it does portend another Toyota sports car above the Scion FR-S. Supra anyone? At a press conference this week Toyota mentioned that company CEO Akio Toyoda drove the car in a simulator around the Fuji Speedway and bested his own real lap time that he set in a Lexus LFA. Those are the things you can do when you engineer a car almost purely out of your imagination.